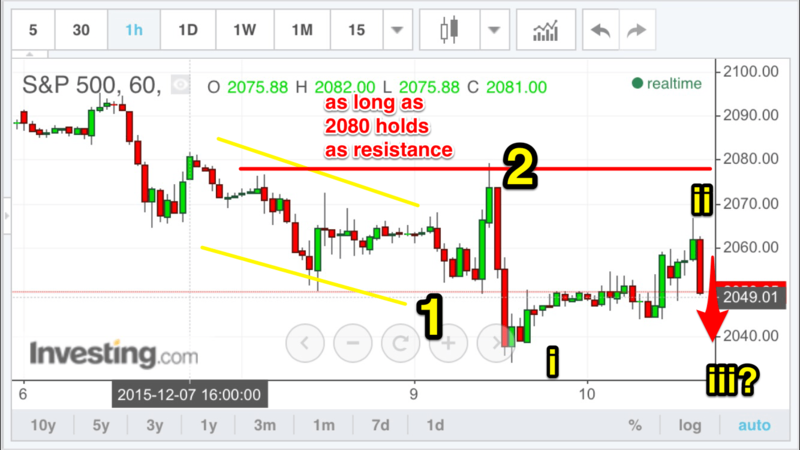 Thursday, December 10, 2015: 2067 high holding below 2080 resistance; Did wave 3 just begin? And today Thursday — here’s what happened — and what I see as a potential big wave iii down. I was expecting 2050 to hold in order for a big down day today– but overnight we got up to as high as 2055– that was the first sign that we wouldn’t have a big down day. Sure enough we went up towards 2067 but stayed below yesterday’s high near 2079. So as long as we stay below 2080– we should ge expecting a 3rd wave down soon. It’s possible today was a wave ii — and towards the end of the day, we began the wave iii down, which so far is steeper than the run up from earlier in the day. Our TF short from 1197.5 is still looking good. And your 210 short strike call spread options will likely expire worthless tomorrow by the close– allowing us to collect some $2500.